Film Editor - Edward Hare, A.C.E. heads out of town every day being careful not to be followed or spotted. reveals the reason for her visit to Medicine Bow. Thorpe arrives in the cabin, Francis pulls out a derringer and tries to kill him. Graham and Thorpe is responsible for killing her daughter. himself in to the law in order to try to start a new life with Frances. British actor began his acting career with Alfred Hitchcock in 1936. Arguably his most famous role was that of the alien Klaatu in "The Day the Earth Stood Still" (1951). 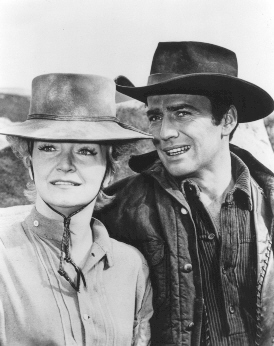 Warren had recently been fired as executive producer of "The Virginian". get there." But apparently Tom didn't last long as the "Banner"
explained by killing her off (Pippa Scott did not appear in this episode).